What a time for PropNex to list on the SGX! Within days more property cooling measures were announced and PropNex share price tanked over 20% in a day! Could this be an investment opportunity? The two largest real estate broking agencies in Singapore have tapped the capital markets to fund their business expansion. ERA (or APAC Realty – the name of the listed entity) was listed on 28 Sep 2017 while PropNex is planning to list on 2 Jul 2018. They both topped the real estate agent count in Singapore. #1 Real estate broking is an asset-light business, so why need to raise funds? The service industry usually does not require large assets to operate. Real estate broking probably requires office, computers and furniture, and lots of agents running around to close deals. There’re little fixed costs and hence they incur low capital expenditure. I wonder why they chose to raise money through listings when they do not need more money to operate. APAC Realty raised $29.1m and 68% of the proceeds would be used for expansion in Singapore as well as in the Asia Pacific region. They had $17.7m cash before they raised this money. PropNex is looking to raise $40.9m, about $10m more than APAC Realty. Similarly, most of the money (65%) would be used for expansion. Before the fund raising, they already had close to $28m cash! PropNex’s capital expenditure has been low, below $1.5m. This is normal as I have mentioned that they are asset light and it is reflective in the items they spent on – computers and furniture. Hence, they do not need a lot of money to grow their business organically. So, why are they raising money? 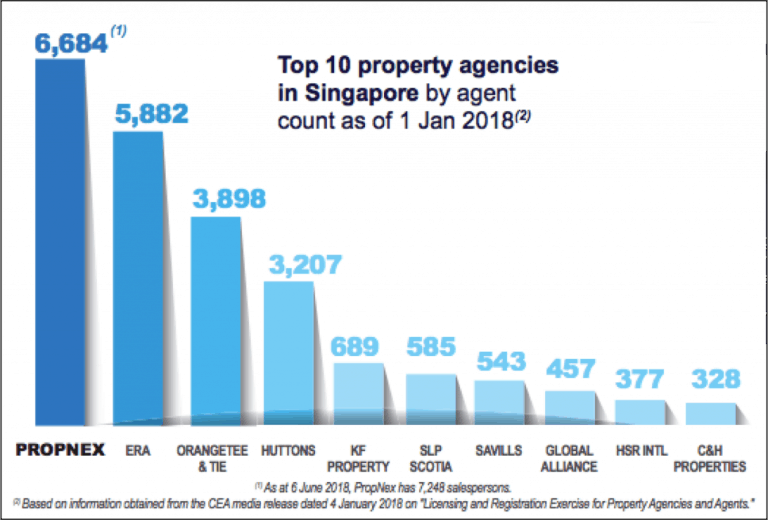 My view is that the APAC Realty management wants to grow the revenue and profits but it is already one of the largest real estate broking agencies in Singapore. The other way is to venture out of Singapore which they already had achieve presence in some countries. But it would be very slow to grow organically and doing merger and acquisition would speed things up. This would cost money and other companies would only sell if APAC Realty is much bigger and have more resources than them. 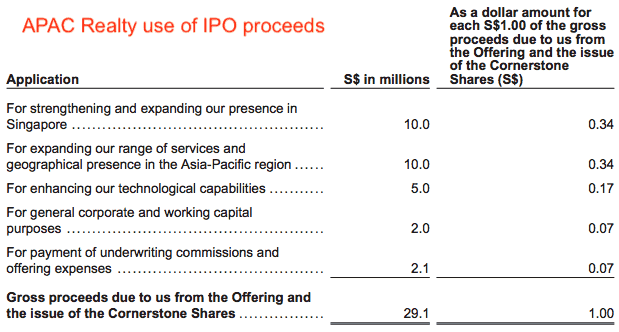 So listing provides the status and the bullets for the acquisitions. In response, PropNex has to do the same (go for listing) or risk falling behind APAC Realty. In a winner-takes-all market, it is important to stay on top of the game and PropNex has to buy out competitors too. This is not good news for investors as the bidding war is likely to start but good for the smaller players because they can now ask for better prices. Personally I’m not keen on an acquisition strategy because it tends to be a more expensive way to grow and it also poses business integration risks. Nonetheless we should see more consolidation in the real estate agency business. #2 Is PropNex transparent with their disclosure? In a recent article published in The Edge – PropNex’s prelim IPO prospectus attracts unwanted attention over discrepancies, 3 discrepancies were reported between the information given during the media release and the prospectus. First, up to $5m were ascribed to the acquisition of Dennis Wee Realty when PropNex said there were no monetary transactions. Second, the audited revenue and profits were lower than what were reported in the media earlier. Third, PropNex understated the concentration risk in Team PNG, or Powerful Negotiators, led by PropNex executive director Kelvin Fong. The Team had some 3,000 agents, or about 40% of the PropNex agents. PropNex clarified that they had never claimed the transfer of agents from Dennis Wee Realty would be free. Erm… ok. They also advised to stick to the audited figures and ignore the numbers that were previously mentioned. 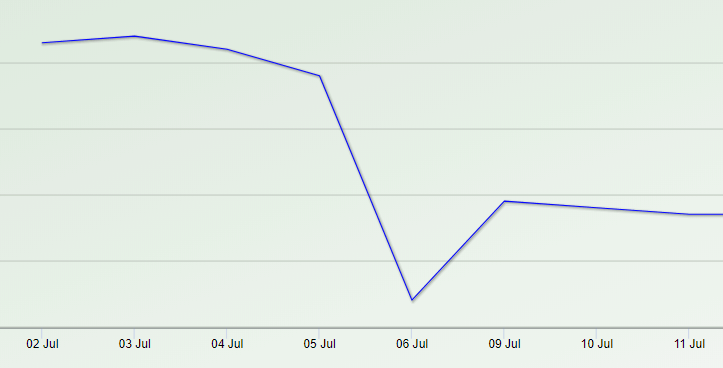 I can accept this as numbers can change after an audit. I don’t see a need to fault the management unless the difference is staggering. However, the last discrepancy which was of most concern to me wasn’t addressed. Brushing it aside would just erode investors’ trust and not a good start for a listed entity. 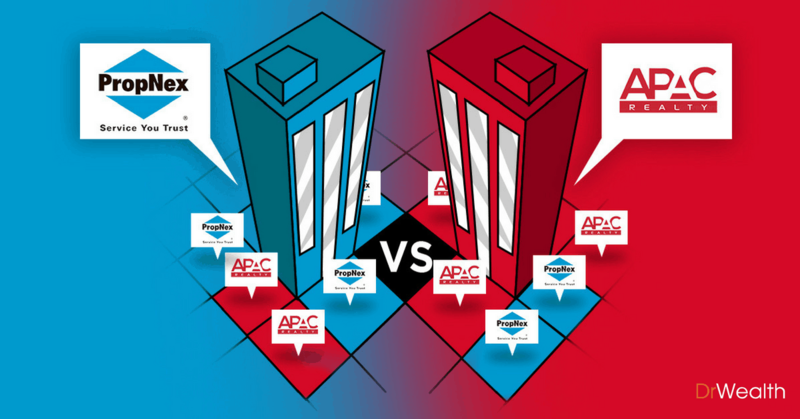 #3 PropNex vs APAC Realty – which one is a better investment? I would use the Gross Profitability Dividend (GPAD) Strategy to evaluate these two companies since they are asset-light. PropNex has higher Gross Profitability than APAC Realty which statistically suggests that PropNex’s share price should do better in the long run. PropNex has indicated that the management intends to distribute at least 50% of the earnings in FY18 and FY19. This would be a decent 4.5% yield based on the price of $0.595 (9 Jul 2018) and 50% of the FY17 earnings per share. APAC Realty announced a 2c dividend per share and based on a share price of $0.61, the dividend yield was lower at 3.2%. But APAC Realty was listed in the second half of FY17 and they only paid out the dividends for half a year. My guess is that the full year distribution should have been 4c. This is because the management has also indicated at least 50% of the earnings to be paid out as dividends. It would be 6.6% dividend yield if we annualised it and both are comparable in this aspect. Free Cash Flow is the main driver of dividend payouts. Given their asset light businesses, I would expect their Free Cash Flow to be very healthy. The calculations confirmed it as the Free Cash Flow per share is higher than the dividend per share. The quantitative figures look good for both companies and very little differences to choose from. I would side with PropNex given a higher Gross Profitability as it is a key Factor to determine long term returns. I see two key risks which would cause the numbers to deteriorate. First is that the real estate market in Singapore slows. 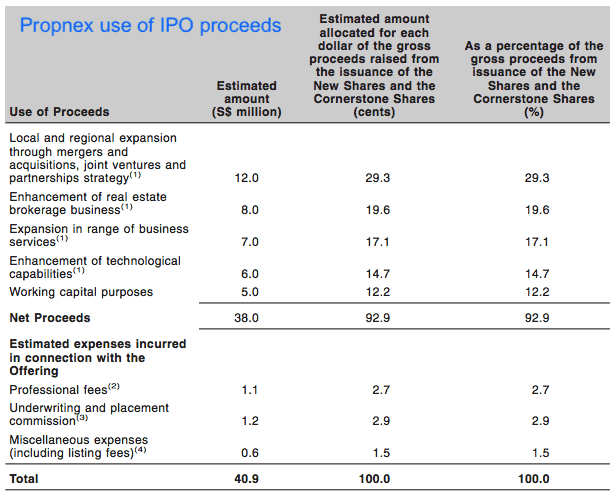 It is not coincident that they chose to IPO at a good time when the Singapore property market is picking up again. Second, it might be very expensive to pursue aggressive Mergers & Acquisitions, bidding up the prices of other real estate brokers in the region. Hence, one cannot assume the numbers would stay this way forever. Of course, if everything goes well the numbers would improve and so would the share price. Singapore’s top two real estate brokers have raised money from the capital markets to fuel their expansion plan in the Asia Pacific region. The expansion strategy is likely to be acquisitions of other smaller real estate brokers. APAC Realty was listed in Sep 2017 and PropNex is following suit to list in 2 Jul 2018. Investors have found some inconsistencies from various sources of information given by PropNex. Questions were raised but the responses were not convincing. This may put off some prospective investors who couldn’t trust the management. The valuations for both companies seemed fair given that the dividend yields were over 4%. The Gross Profitability of 37% for PropNex was higher than APAC Realty’s 23%, and this primary indicator of future returns was what set them apart. Judging that the market is pricing APAC Realty above the IPO price, I would expect the share price for PropNex to go up once the shares start trading. Disclaimer and disclosure: This is an open sharing of my thoughts about these two stocks. Please do not take this as an advice or recommendation. Be responsible for your own actions and always seek a financial advisor if you are unsure about making decisions on investments. 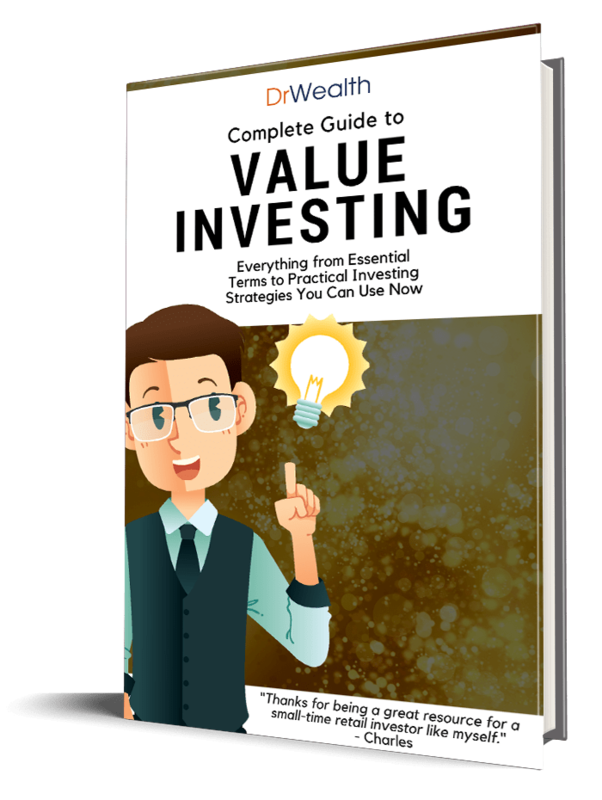 Do-It-Yourself investing can be very challenging for many people. I do not have any position on these stocks at the time of writing. I may or may not buy the stocks in the future. #AskDrWealth If I Invest In DCA and Price Goes Down Should I Cut Loss? Interesting articles to read since both company is the talk of the town now. Thanks for the sharing. I wonder whether Gross Profitability is a good measure because for both companies the most important assets are the agents who clinch the deals. Yes in general for asset light companies. One can also argue that tech companies’ real assets are the talented programmers, and Gross Profitability applies too. Thanks for the sharing. I think the most important assets of these two companies are their agents who are clinching the deals. So is Gross Profitability is good measure of returns for them? Just my thoughts.